Once vetted and cleaned up, it was clear Diamond was a white Schnauzer. 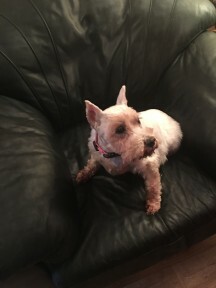 Erica said she was quite a mess because she had been left outside all day when her owner became unable to take her out or bathe her or take her to be groomed. 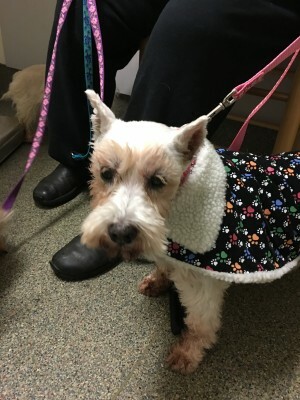 Adding to Diamond’s problems, she had become blind when her dry eye went untreated. The rescue’s vet says, with treatment, she may well get some sight back but perhaps only the ability to see shadows. Currently, Diamond is on two types of eye drops which cost about $100.00 per month. However, eventually she will be able to stop one of the drops and just continue on the other eye drops which will cost somewhere between $40—$70 per month. Despite her lack of sight, Diamond gets around well and has a very sweet personality. She is housebroken and will tell her person when she needs to go out. But, like most of us, she doesn’t like rain. Diamond is not overly needy and will entertain herself. However, she does love to be held and cuddled. Because she is so gentle and sweet, giving her the eye drops is very easy. Diamond would love a home with an at home person to keep her company and give her attention. She is somewhat independent, though, so someone working at home would not have to worry about Diamond being underfoot. Diamond doesn’t necessarily need a fenced yard as long as someone stays with her outside. She would most likely be okay with cats due to her blindness and with older children who could learn how to treat her. Most rescues, like Scottie Rescue of Greater NY/NJ, take in dogs that are in need of vet care which, as we all know, can be expensive. Rescues need support and donations to do their work. During the holiday season of gift giving, please think about making a generous donation to your favorite rescue so they can continue to save and care for dogs like Diamond. 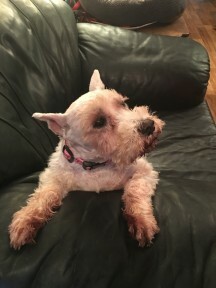 Learn more about Diamond and her pals in Scottie Rescue, volunteer, apply to adopt a rescue or make a much needed donation. Rescues, as 501C3 charitable organizations, depend on volunteers and donations from supporters. Visit the Greater NY/NJ Scottie Rescue on their Facebook page or their website.